Streamers differ from most other types of flies in that they imitate baitfish rather than insects. Some streamers bear a remarkable similarity to real baitfish. Others bear much less resemblance to the rea1 thing. Instead, they attract gamefish with their bright colors and flash. Hackle-wing - The wing, made of long hackle feathers, is relatively stiff. It has litt1e action in still water but works well in current. These flies sink readily, so they can be fished fairly deep even with a floating line. Bucktai/- Because the wing is made of bucktail or other hair, these flies sink more slowly than hacklewings. They can be fished deep only with a sinking or sink-tip line. 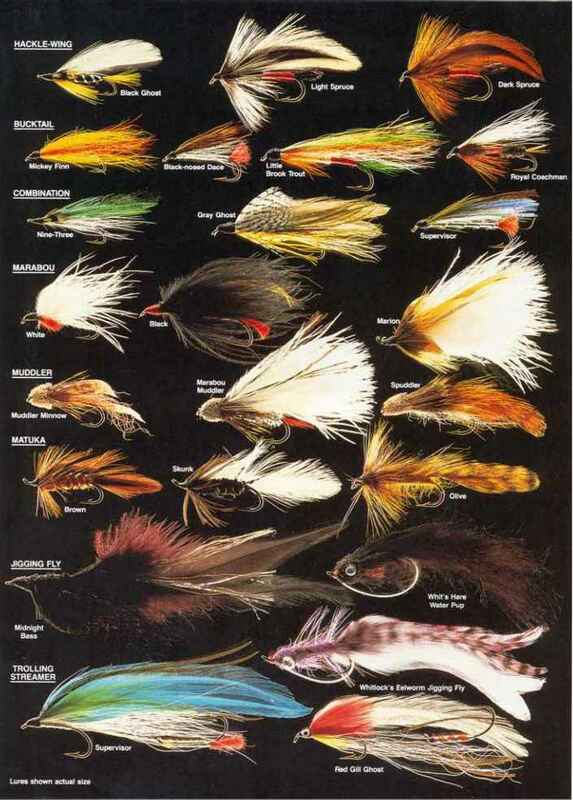 Like hackle-wings, bucktails lack action in still water and are used mainly in current. Combination - These flies have wings of feathers and hair. They sink slight1y slower than a hacklewing. Like hackle-wings and bucktails, they are best suited for moving water. 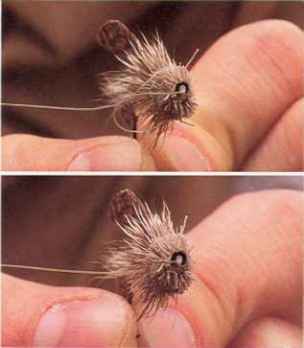 Marabou - The fluffy marabou wing assumes the shape of a baitfish when the fly is wet. A marabou sinks more slowly than a hackle-wing. When twitched, the fly has a pulsating action, so it works well in either still or moving water. Muddler - These flies have large heads of clipped deer hair and wings of turkey quill feathers, marabou or hackle feathers. Among the most versatile of streamers, they work in still or moving water. Most muddlers float, or sink very slowly. These models are usually fished on the surface to imitate a grasshopper. But some muddlers have wire windings beneath the body material, so they sink more rapidly. These weighted models can be fished on bottom to imitate a sculpin. Matuka - The hackle-feather wing is wrapped the entire length of the body with thread or tinsel. Because of tbls wrapping, the wing never becomes fou1ed in the hook bend, as it sometimes will on an ordinary hackle-wing. The matuka wing forms an upright keel, giving the fly good stability in fast water. Matukas sink at approximately the same rate as hackle-wings. Jigging fly - The weighted head makes the fly sink rapidly and gives it a jigging action when retrieved in jerks. The wing is usua11y made of hackle feathers or a strip of rabbit fur. Because of their vigorous action, these flies work well for fishing in still water, especially for bass. 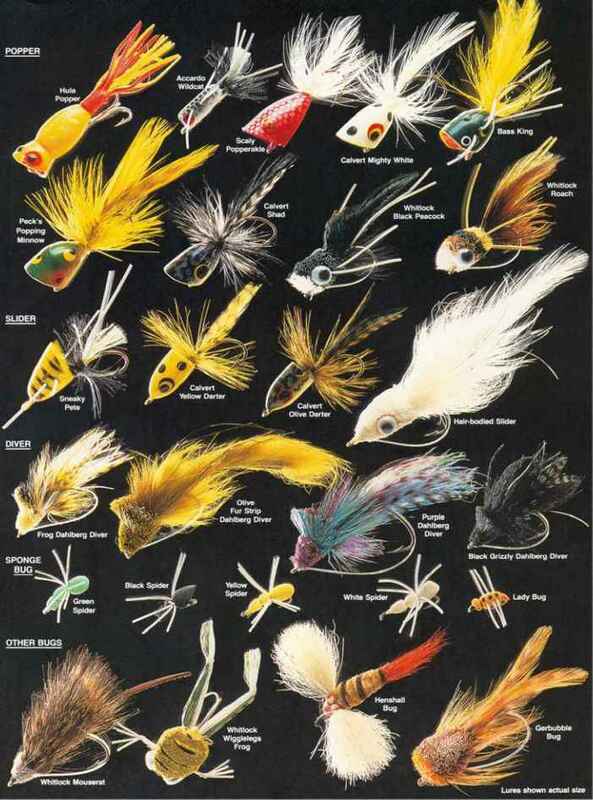 POPULAR STREAMERS include (1) hackle-wing, (2) bucktail, (3) combination, (4) marabou, (5) muddler, (6) matuka, (7) jigging fly, (8) trolling streamer with trailer hook. As gamefish grow larger, their diet generally includes less insects and more baitfish. This explains why streamers catch more big fish than most other types of flies. Streamers will catch almost every major species of gamefish. Although they are often considered to be trout and salmon lures, streamers also work well for smal1mouth, largemouth and spotted bass; white and striped bass; crappies; and northem pike, muskies and pickerel. Size 4 to 10 streamers work well for most trout fishing, but you may need sizes up to 1/0 for large trout. 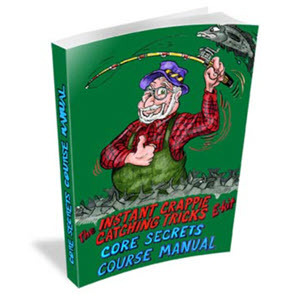 For crappies, use sizes 6 to 12; for white, smallmouth and spotted bass, sizes 2 to 6; for large-mouth bass, pickerel and salmon, sizes 1/0 to 4; for northem pike, muskies and stripers, sizes 3/0 to 2. Because streamers imitate baitfish, you can retrieve them upstream, across stream or downstream. They can be worked fast or slow, with a steady or jerky retrieve. You can fish a weighted streamer along bottom, skitter an unweighted model on the Surf-face, or skate a streamer across current by attaching it with a riffling hitch. A fly tied with a riffling hitch has a special appeal to steelhead and salmon. When fishing a streamer in still water, retrieve with short twitches mixed with long, darting movements. A fast, darting retrieve works well for schooling white bass or other surface-feeding fish. Slow-trolling or drifting with streamers is an effective method for fish that suspend. Small bucktail streamers work well for crappies; trolling streamers for landlocked salmon and brook trout. Use a sinking fly line and vary the amount of trailing line as your boat moves along. Some anglers use streamers for locating fish. Because streamers can be retrieved rapidly, they cover a lot of water quickly. 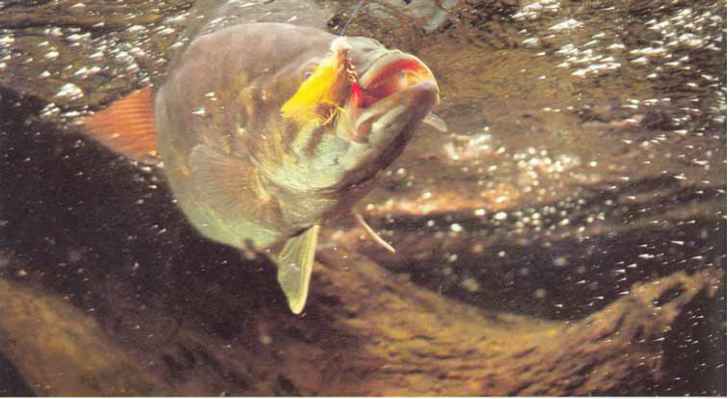 Eyen if a fish is not interested in striking, it rnight make a pass at a fast-moving streamer and reveal its location. Then, you may be able to catch it with a different type of fly. 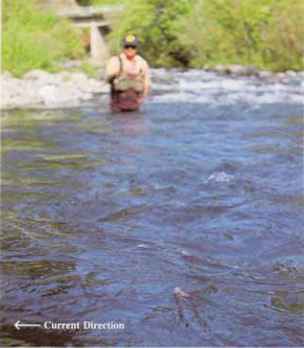 The lines and leaders used with streamers are the same as those used with wet flies (page 140). To maximize the action of a streamer, be sure to attach it with a loop knot (page 12), especially when using a jigging fly. TIE a riffling hitch by attaching your line to the eye, then making a half-hitch just behind the head (above). Tighten the knot (below). The line should be on the side of the fly nearest you as the head faces downstream. 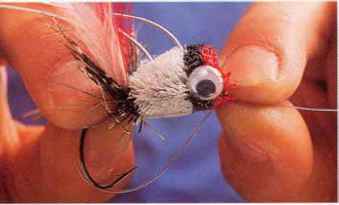 IMITATE a darting baitfish using a muddler-type fly with paste floatant on the head. Use a sink-tip line and 4-foot leader. Let the tip sink to bottom, then retrieve slowly. The fly swims just off bottom, without snagging. SKATE the streamer at an ang1e to the cunent by casting across stream, then lifting your rod tip. A fly tied with a riffling hitch creates more surface disturbance because the cunent strikes it broadside. USE a tandem streamer rig for schooling fish such as white bass. When a fish swims off with one streamer, other fish follow in an attempt to stea1 the lure. 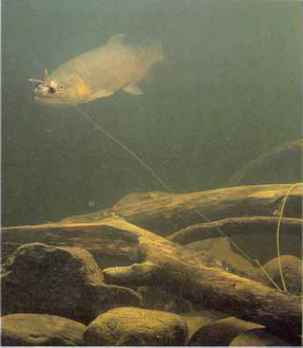 Often, a following fish grabs the second streamer. A smashing surface strike ranks as one of the most exciting moments in fishing. But excitement is not the only reason for using these topwater flies. 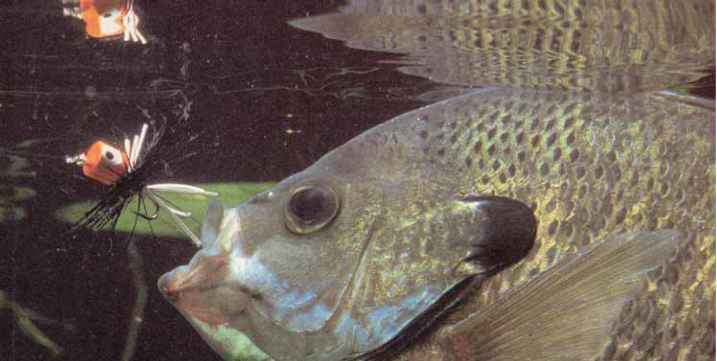 Few other lures work as well when fish are feeding on surface foods like large insects, frogs or mice. Many fishermen use bugs only when they see fish feeding on the surface. 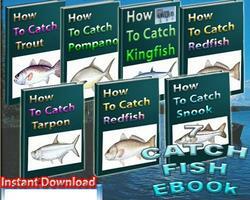 But these lures can be effective whenever fish are in the shallows. They work particularly well for nest-guarding fish during the spawning period. 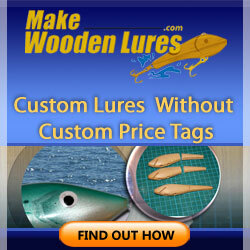 Popper - These lures have bodies of plastic, cork, balsa wood or clipped deer hair. Most have hackle collars, and hair or feather tails. Many have rubber legs on the sides of the body. Poppers get their name from the popping sound made by the cupped or flattened face. Slider - Similar to poppers, sliders have a face that is bullet-shaped rather than cupped or flattened. Sliders cause less surface disturbance than poppers, so they may work better at times when fish spook easily. Because sliders do not dig as much as other bugs, they are better suited for skittering over fast water and for slipping over lily pads or other dense surface cover. The streamlined shape of a slider makes it easier to cast than a popper, especially in windy conditions. Most sliders imitate crippled minnows on the surface. Diver- These bugs are also similar to poppers, but the top of the head slopes back. The sloping head causes the lure to dive when you pull it forward. As they submerge, most divers gurgle and emit an air bubble. Divers will remain under water as long as you keep pulling them. When you pause, they float back toward the surface. These lures are excellent frog imitations. Sponge bug - Used primarily for panfish, these bugs have a soft body, so fish will hold them longer than hard-bodied bugs. Most have live-rubber legs and resemble spiders. Sponge bugs float low on the water or ride just beneath the surface. Other bugs - This category includes bugs that look like mice, frogs, moths, dragonflies or nothing in particular. Most are tied with clipped deer or elk hair. The hollow fibers provide excellent flotation. These flies are generally fished slowly, with slight twitches and long pauses. Some are difficult to cast because they have long hair wings that stick out sideways and cause wind resistance. Hair bugs usually hook fish better than hard-bodied bugs. Fish hold onto hair bugs longer, giving you more time to set the hook. But hair bugs are less durable, and are harder to keep afloat because they soak up water. When fishing in weeds or brush, choose a bug with a weedguard. Tbe best type of weedguard is made from a heavy monofilament loop. 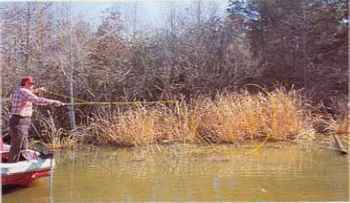 But a weedguard reduces your hooking percentage, so you should select bugs with unprotected hooks when you will be fishing in open water. Another consideration in selecting these lures is the size of the hook. The bend and point of the hook serve as ballast; if the hook is not large enough, the bug will often land upside down. POPULAR BUGS include the following: (1) popper, (2) (5) hair mouse, (6) hair frog, and (7) moth imitation with slider, (3) diver, and (4) sponge bug. Other bugs include hair wings. A fish may take a bug with a jarring smash, but often the strike is much more subtle. Sometimes the lure seems to disappear from the surface with no noise or swirl. You must watch the lure closely and react before the fish ejects it. To retrieve a bug, keep your rod tip low and pointed at the bug whi1e stripping in line. If you retrieve by lifting the rod tip, your rod will be out of position to set the hook. Most fishermen consider bugs to be largemouth bass and sunfish lures. But bugs also work well for small-mouth and spotted bass, crappies, trout, northern pike, pickerel and muskies. For northern pike and muskies, select bugs in sizes 4/0 to 1/0; for largemouth bass and pickerel, sizes 1/0 to 2; for smallmouth and spotted bass, sizes 1 to 6; for trout, sizes 2 to 8; and for bluegills and crappies, sizes 8 to 12. The retrieve techniques used with various types of bugs differ greatly. Poppers can be twitched sharply to make popping sounds and bubbles. But a gentle twitch or a slight pull that just ripples the surface often works better. Fishermen commonly make the mistake of pulling the popper too far. 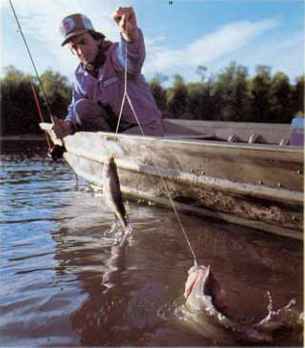 In most cases, use the shortest tug that still makes the lure pop. Each twitch or pop is usually followed by a pause. But a fast popping retrieve, without pauses, sometimes works better for bass, pike and muskies. Sliders can be fished with a slow, steady retrieve or a gentle stop-and-go retrieve. You can also skate a slider across the surface so it kicks up a slight spray. A diver is more versatile than other types of bugs. You can twitch it as you would a popper; retrieve it with a short pull followed by a pause to make it gurgle, dive, then resurface; or fish it underwater by stripping in line, as you would fish a streamer. Most other bugs work best in very shallow water. They do not make enough noise or disturbance to draw fish from the depths. Retrieve them with gent1e twitches followed by pauses. These lures cover little water, so you must cast accurately to rising fish or close to weeds, brush or other likely spots. SELECT a bug with ample clearance between the body and the hook point (top) rather than one with little clearance (bottom). lf the hook point extends forward past the rear of the body, you will rniss too many strikes. TUNE a hair-bodied popper or diver if the lure will not pop. If it skims instead of popping or diving, bend the back of the hook down. This causes the face to catch more water when you puH. nip at the legs or hackle collar, but do not take the lure deeply enough so that you can set the hook. UNSNAG a bug by raising your rod tip, then snapping it downward to cast a loop of line beyond the snag. If the fly does not puH free, let the line fall to the water beyond the fly, then puH sharply. 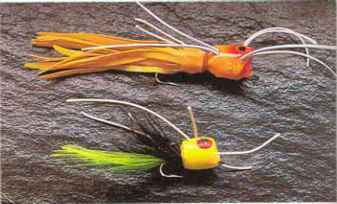 Is hair flies better than marabou feathers for fly fishing? What hair bugs have wings? How to tie weighted marabou streamer for steelhead? What are slider and streamer lures?